Is the Surge of Repeat Borrowers at Prosper Over? Regular readers of the blog will know I am a big fan of investing in repeat borrowers. This selection is only available at Prosper and it has been the focus of my investments there for almost a year now. But lately I have noticed that there are not as many repeat borrowers as there used to be. So, I did a little digging. I fired up Lendstats and went looking for the data. For each selection of loans, Lendstats provides the percentage of repeat borrowers, so I just went through each month and recorded the results in a spreadsheet. Sure enough, we have been on a downward slide in the percentage of repeat borrower loans since November last year. Here is the chart showing all the numbers along with the three month moving average. As you can see for several months last year we had quite a bump in the number of repeat borrowers. When you look at the long term average from all of Prosper 2.0 the percentage of repeat borrowers has been about 33%. So it is quite possible we will see another uptick here again soon. So far in March with just a small number of loans issued we are back around 30%. Why the Focus on Repeat Borrowers? I have always liked repeat borrowers for one reason: returns. If you look at all first time borrowers on Prosper 2.0 there have been almost 15,000 loans and these have returned 7.62% according to Lendstats. Now, look at just repeat borrowers. There have been around 7,500 loans from repeat borrowers and they have returned 12.1%. So, with just that criteria and nothing else you can potentially bump your ROI by 4.5%. Sign me up. Of course, there are also plenty of opportunities with new borrowers and if you want to put money to work quickly I highly recommend you include them in your investing. You can take a look here at how I am investing with Prosper in 2012, as well as Lending Club, and you can get some ideas for good filters for new borrowers. Until proven otherwise, though, I will continue to put 75% or more of the new money I invest in Prosper into repeat borrowers. I just hope we see an uptick in the number of repeat borrower loans soon. Well, I don’t know, perhaps the surge is temporarily over. I suspect that this will naturally go through up & down periods. What I do know is that Prosper doesn’t run supermarkets where repeat customers come in every week or every couple of weeks to restock on groceries. Prosper in fact encourages consumers to be responsible & reduce debt over time & not just re-stock on it continuously. So this is why Peter’s post is a bit confusing to me. Isn’t something like 65% of p2p loans supposedly listed by borrowers as for debt reduction/consolidation? Indeed isn’t one of the mission statements of p2p to help the indebted consumer get rid of consumer debt? Or was there a 2nd part that I missed which stated…………..so that they can come back to borrow again & again thereby enabling Peter & others to make as much interest as possible? Prosper is only a 6 year old company & these are mostly 3 year loans. How many times would you like the borrowers to come back for more money in that time span? You know the funny thing is that a post like the one above on a banking blog, a consumer finance/credit blog or a debt reduction blog would have people jumping up & down & screaming to no end. Words like hypocrisy, exploitation, predatory, greed would be prevalent. These words would NOT be directed towards Prosper mind you, but rather towards the poster. I guess Gordon Gecko was right in that “greed is good”, huh Peter? I could care less if people are using the loan for as long as they pay me back. 🙂 I could also care less about the feel good Spin of P2P lending. I am profiting because others value instant gratification more than delayed gratification. I do not need to delude myself and justify it with P2P warm fuzzes. P2P warm fuzzes are a lot like rich people buying hybrids, electric cars or Carbon Offsets. They may make you feel good, but they don’t change the reality of your existence. Repeat borrower notification would definitely be something I’d like to see as an available filter on LC. Charlie H………I agree with you completely & have said so many times here. But there are many here who feel the warm social good feelings …………….or at least there used to be many here when I first came to this blog a year & a half ago. Perhaps they’ve “adjusted” their views to the reality of the dog eat dog world we live in. Oh, I’m sorry. Do these fall under the category of “personal attacks”? @Dan, I have actually struggled with this philosophically. While I invest in p2p lending in order to make a good return on my money I also want my investment to be a win-win. For pretty much any business idea to be sustainable long term it needs to provide benefits for both sides of the transaction. So I am not in favor of people endlessly racking up debt but I also know there are plenty of people who have dug a deep whole for themselves. Most of the loans I invest in are for $15,000 or less (many are for $4,000) because Prosper reduces the amount you can borrow for the higher risk borrowers. If a borrower has $20,000 in credit card debt and are paying 32% on that money then a three year fixed payment loan at 28% is going to help them pay down that debt. Then, if they are serious they will get another loan as soon as they can and pay down the rest of their debt. Of course, many people will not pay down that debt, as you have pointed out many times. Most of these people are not so destitute that they have no choices. They could get another credit card or they could get a p2p loan. If they are going to take out a loan I would rather profit from it that have Chase or Citibank profit from it. That is my rationale – I am sure you will find flaws in my argument but I am comfortable with it. One last thing, I read you need $350K in salary to be part of the 1% – I am nowhere near that level. @Charlie, I think there are many investors who are just like you. While I don’t want warm fuzzies from investing in p2p, as I said above I do want it to be a win for both sides. @Danny, I remind Lending Club of this regularly – with only 5% of their borrowers taking out a second loan they just don’t view repeat borrowers as a high priority. Peter…….Actually you don’t need $350k in salary to be part of the 1%. You need $350k in total income. An important distinction considering that both yourself & Warren Buffett make way more in “other income” than in salary. Also the $350k is a number for the entire US. If you live in Manhattan you’ll need over $1 million in income to be part of the 1% among your fellow Manhattan residents. On the other hand if you lived in say Flint, Michigan, I’m sure that $100k a year will get you to the 1% club compared to your fellow residents. Peter………..Yes, I will be taking every opportunity to annoy you (at least for a few weeks) in order to express my displeasure at your entirely unwarranted deletion of my post earlier this week. But above & beyond annoying you like a hungry mosquito, let me just say this………. Since I’m not part of the warm & fuzzy do gooder crowd, I have no problem with people borrowing as many times & for any conceivable reason that they may see fit. They’re adults & as Charlie so eloquently pointed out, it is really just a matter of us profiting because we’re comfortable with delaying gratification whereas some borrowers clearly got a bit over their heads because they chose instant gratification. As someone who has spent a good deal of his past in the “instant gratification” camp in both financial matters as well as life in general, I can attest to its powerful allure & many highs. So I have no philosophical struggles whatsoever even though it’s more of a moot point with me as I don’t go out of my way to target repeat borrowers. Turning to Prosper I think that range of 25% to 35% is just about as high as one can realistically expect going forward. The p2p borrowers get a lower interest rate. The p2p lenders get a higher return. It’s a win-win. The warm feelings I get are in seeing the market become more efficient, which allows resources (labor and capital) to be allocated elsewhere. The nation is wealthier, and society is better for it. Obviously, it would be nice to know that a lot people are using these loans to get out of debt (and hopefully stay out of debt). But we can’t realistically know that. We can’t know whether the borrowers are using the loan for the stated purpose in their listings. In the end, the best we can hope for is investing in those borrowers deserving of loans. I measure this by whether they pay the loan back. Under this scenario, not only do I make a profit, but I have greater funds with which to invest in other borrowers who are also deserving of a loan. Now you know that I, too, am a great humanitarian! @Peter, Wasn’t it fairly recently that Prosper took note of the repeat borrowers being a lower risk investment and then adjusted their UW models reducing the interest rate (and thus return) on repeat borrowers? I’m not sure how that 12.1% number will hold up over the next year. …I should also note that I don’t filter for repeat borrowers, except for those with whom I already have a loan–but that is more to keep an eye out for danger signs in the Notes I currently hold with them (though with WB2 gobbling up loans so quickly, I doubt I will see many of them show up when I run the search) than it is to reinvest in those borrowers. @Dan, Thanks for comparing with me with Warren Buffet but sadly even with my other income I am nowhere near the 1%-er level of total income. I do think that certain parts of the lending industry such as payday lending are more a win for the lender than borrower. A 1000% interest rate is indeed usurious but a 30% interest rate on a $4,000 loan, while very high is unlikely to lead to financial ruin and in fact could help a conscientious borrower start down the path to better financial management. Maybe I am a bit of a polyanna but that is how I look at it. @Roy, Yes Prosper did reduce their interest rates on repeat borrowers recently which is why I have been surprised that the surge hasn’t continued. So, it is true the 12.1% return could start going down. But there is still a 4.5% gap right now and even if it drops to a 2.5% gap it will still be worth it in my opinion. I’m into P2P lending because it makes me money… I’m not into it to be a charity case (though I tried that in Propser 1.0 to bad results). This is for a couple reasons and in no particular order… first, this is not a charity site but a site to make money. Second, if borrowers were that bad off there are many other places to go from free debt counseling to actual charities to friends to whatever. This doesn’t mean that I want to take advantage of people but I also expect them to make a rational decision when they’re getting a loan… Propser isn’t a payday or predatory lender and everything they do and advertise (with the resulting expectations) are on the up-and-up. This leads into the third point.. everyone can really only take into account themselves… I don’t have the capacity to fully comprehend a borrower’s life circumstances and what will best support their life and financial decisions… I barely have enough data to make a purely financial decision. In other words, even if I wanted to make someone’s loan a charity case, I have no idea if it would even be what they need, nor does Prosper vet along these lines. Therefore, I have to assume that they’ve made a fully rational decision with all their facts and circumstances at hand and that this loan will be the best thing for them at the current time. As someone else mentioned, 28% maybe high (to me) but may just be what they need and also what I need in terms of a higher return. The final point is that as someone else talked about, me simply achieving what is best for me is also best for the market and hence everyone involved. And so on the specific topic, I’m totally great with repeat borrowers or anyone else in between. If I’m interested in making charity loans I loan through Kiva and have invested a good chunk through that platform. That way I know borrowers are vetted for what is best for them and that they have a direct need for the money that will go into something productive which will lift not only themselves but their whole community. I don’t earn a direct financial return, but that’s not the point of Kiva and the social and long term economic returns far outweigh any sort of financial gain. @Shawn, Thanks for chiming in. You are dead right that as investors we are dealing with only the bare minimum of information and we can never have any idea whether the loan is good for the borrower or not. And if the borrower needs a 28% loan to stay financially solvent, for whatever reason, and they can make the payments then it seems to me like a win-win. I am also a big fan of Kiva and I have some money “invested” there. But the fact is that Kiva and Prosper/Lending Club have very little in common from an investment perspective. Of course they’re different but also depends on how broadly you define investment in this case. It’s not a money-making investment but it’s still putting money into people’s businesses and so still meets the definition… on top of being a long term social investment. @Shawn, Kiva does really fit somewhere between charity and p2p lending. Because you are investing in people (for them to use in their business) it has some similarities but personally I think about it more as a donation. The great thing is that I get to see the fruits of this donation and then get to re-donate my money again and again. But you are right, this could be viewed as an investment albeit one with a zero percent return – kind of like my money market account :-). First off, as a percentage repeat borrowers may be lower and yet there may be more repeat borrowers as an absolute number. Your analysis doesn’t specify. 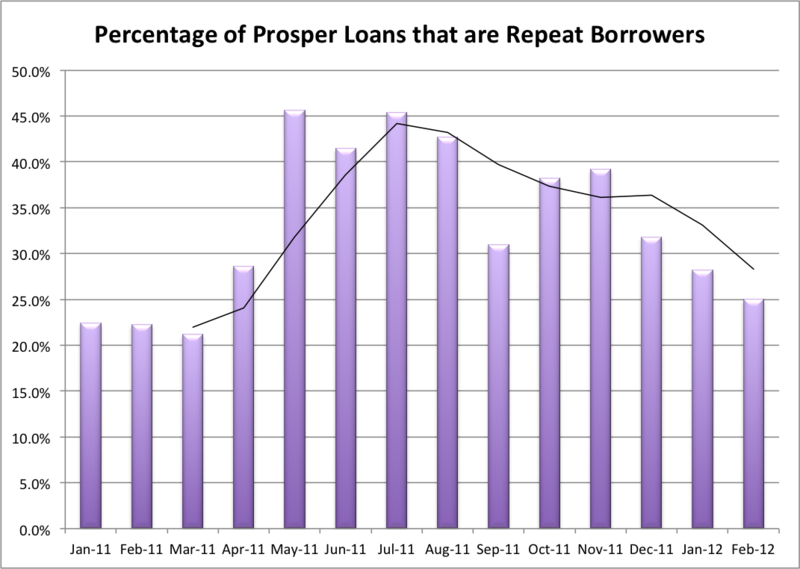 Perhaps Prosper’s marketing is paying off in tons more borrowers coming in, so the repeaters are a lower percentage. Second, I’m not sure where all the feel-good crap comes from. I don’t loan money to people in order to feel good. I give it to them (and I do to the tune of thousands a year). I loan money to make money. If that is a good thing for the borrower, then they can take my loan. If not, then they can do what I do, receive interest instead of pay it. I would hope that many of Prosper/LC’s borrowers are folks who just found Dave Ramsey and want to pay off their loans at 15% instead of 29%, but you and I both know that just isn’t true. Personal finance is 80% behavior and 20% knowledge. They might as well pay me 25% instead of the bank for their hyper-consumption lifestyle. I do prefer to loan money to people who are consolidating debt rather than buying a motorcycle, but I do that mostly because the data suggests the return is better. Last, if Peter is in the 1%, what business is that of yours? He provides a great service, free information, and all you have to do is look at an occasional ad. Sounds like a win-win to me. People who provide win-wins over and over on an ever-increasing scale get rich. It’s called capitalism.